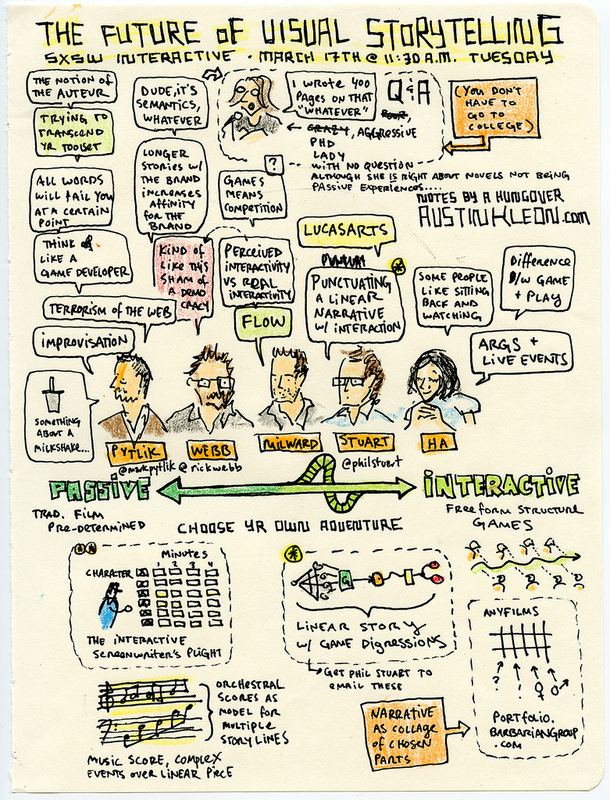 sketchnotes by Craighton Berman, click for full-sized images! This post is the first in a new “sketchnotes channel” on Core77 (www.core77.com/sketchnotes) that will explore the application of visual thinking tools in the worlds of design and creative thinking. The recent rise of the “visual thinking” movement in business borrows from the natural ways designers work—using sketches to explore and express ideas, manipulating complex systems of thoughts on sticky notes, and using rough visuals to make sense of the world. Humans are, of course, wired to be visual thinkers from birth, so it’s only natural that people are attracted to these tools, and the power they have to help solve problems and explore opportunities. 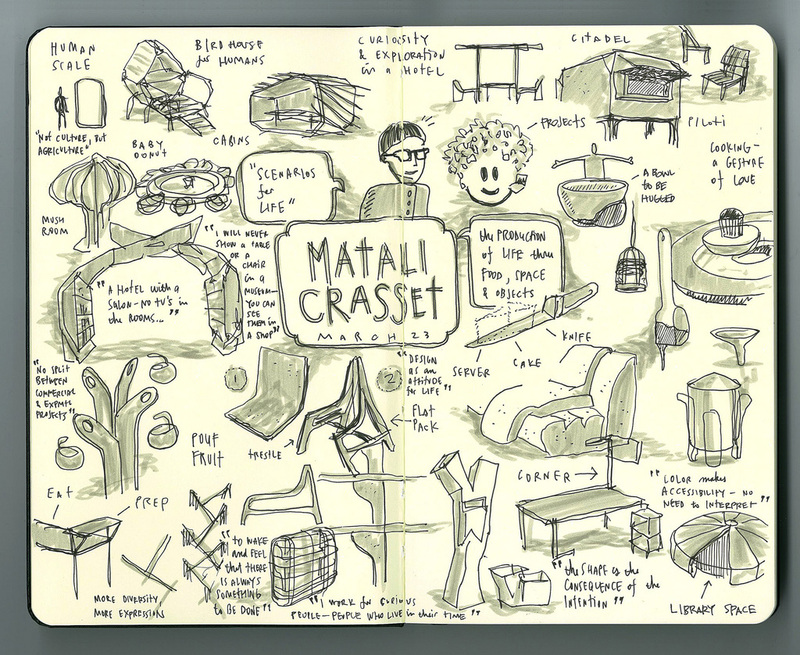 In the long list of tools one could use for visual thinking, sketchnotes are one of the most exciting. 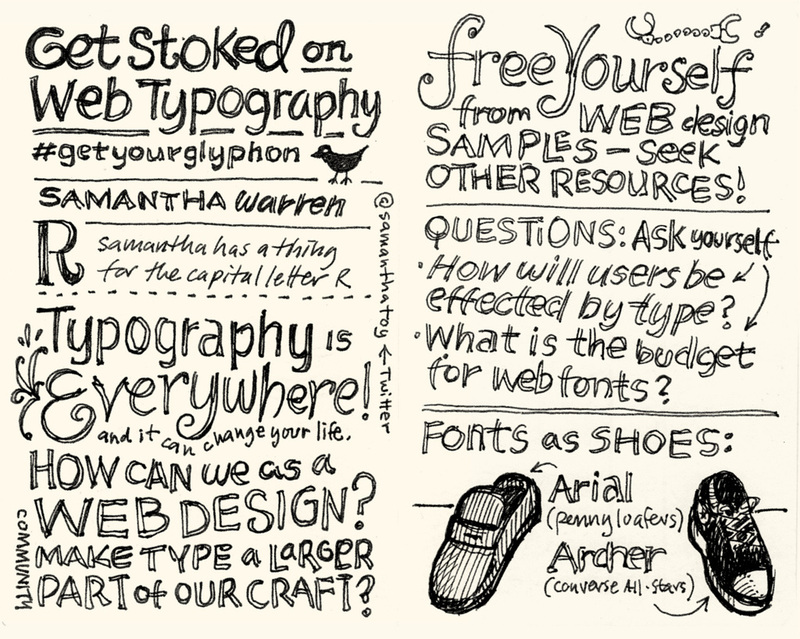 Simply put, sketchnotes are visual notes that are drawn in real time. Through the use of images, text, and diagrams, these notes take advantage of the “visual thinker” mind’s penchant for make sense of—and understanding—information with pictures. Often these notes come out of lectures or conferences, and have gained a lot of attention and interest in the past few years when people post scans of their sketchbooks from events like SXSW or various design conferences for the whole internet to see. This kind of note taking has an obvious appeal for both the coverage of the event as well as the aesthetic quality of getting a peek inside someone’s sketchbook—but good sketchnotes are actually much more than a set of beautiful doodles. Sketchnoters aren’t reporters, information designers, or illustrators. They’re actually all three at once. This form of rapid visualization forces you to listen to the lecture, synthesize what’s being expressed, and visualize a composition that captures the idea—all in real time. A musicians’ “circular breathing” for the Moleskine crowd. Instead of recording what’s being said verbatim, good sketchnotes capture the meaningful bits as text and drawings. Better sketchnotes use composition and hierarchy to give structure the content, and bring clarity to the overall narrative of the lecture. 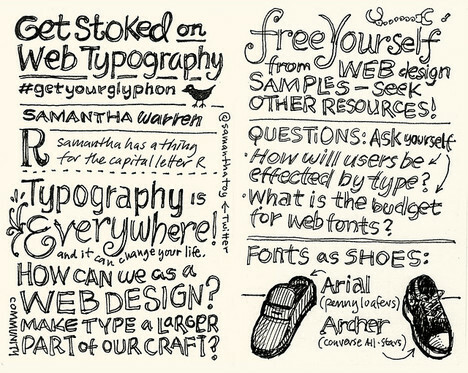 The best sketchnotes express a unique personal style and add editorial comments on the content—entertaining and informing all at once. They’re PERSONAL: They act as a visual journaling tool so when you attend a lecture, you can remember the bits of information and images that have meaning for you. Sketchnotes are also a great way to record your ideas and observations—these aren’t reporter’s notes, they’re your thoughts and interpretation of the subject matter as well. They’re PUBLIC: Great sketchnotes create a “map” of the presentation that provides a visual summary for others to read and explore. 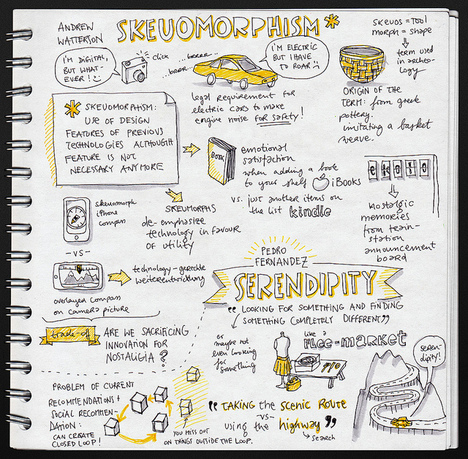 More and more sketchnotes are shared online, giving people views into both the content that was being presented, as well as the point-of-view of the sketchnoter. 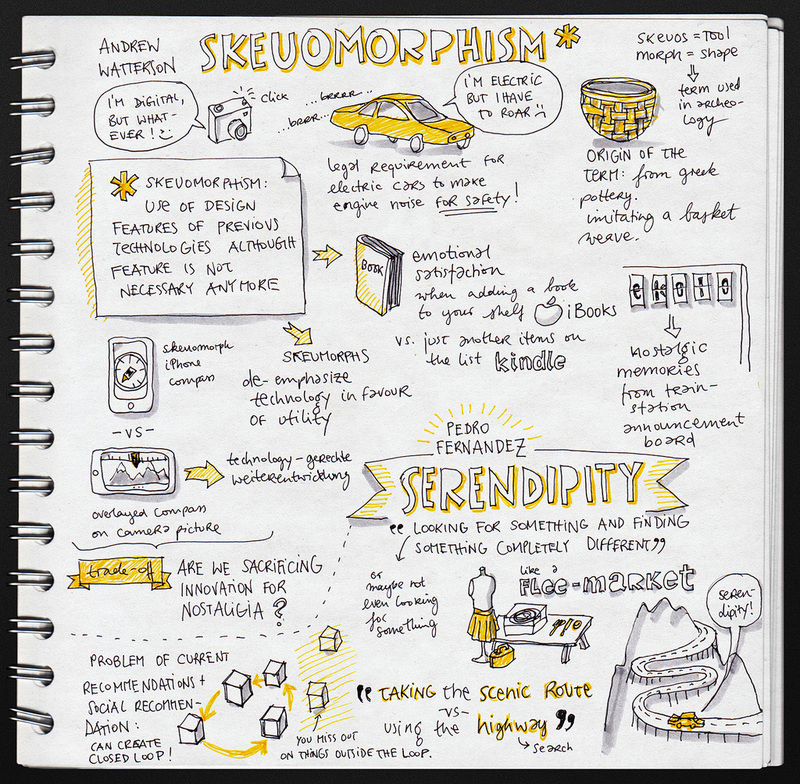 They’re PRACTICE: Sketchnoting hones your skills in observation & listening, distilling and structuring information, creating narratives, and—of course—rapid sketching. Consider sketchnotes to be the antidote for the age where lecture attendees only partially engage in the speaker’s presentation while they Tweet the last quotable quip and check their RSS reader for the latest update on Engadget. The sketchnoter is focused, singularly engaged in what’s being said, and is fully engaging their mind to shape something from that content on the blank page in front of them.